What is is like to experience, The Burrito Project? Below you can hear from some of our volunteers. We look forward to reading about your experience too. The first thing I would do is give half of it to The Burrito Project. The Burrito Project makes burritos for the homeless. It makes me happy when I see the homeless smile. I smile because I know I did something to help. The Burrito Project is a community service group that makes burritos, buys water and donates clothes. The way the group made burritos was by getting tomato sauce, beans, rice and veggies (optional). Then you go to downtown LA and hand out burritos, water and clothes as I said before. The emotions that really come to me the most are happy, sad and annoyed. I say happy because the smile with no teeth just lights me up inside and when they take that first bite, it looks like they’re eating heaven. It makes me sad because just to see how many people are sitting in tents with their children and sick husbands or wives and how little they have. It annoys me because if we can give to Africa to build schools, then why can’t the government build at least a building to teach and give them food and a little education? My involvement with The Burrito Project started with my Facebook connection to, Alan Pinel. One day he posted that volunteers were needed for the Silverlake Burrito Project & the rest is burrito history. I had previously volunteered with other organizations that provided meals for the homeless population but their events were held on major holidays & I felt it wasn’t enough. I wanted to be part of an organization that was more frequently committed with its involvement & The Burrito Project’s monthly event was the answer. The feeling of community at The Burrito Project is fantastic and I’ve had the opportunity to interact with wonderful folks each month; smiles, cheer and a caring spirit are always in abundance. It is The Burrito Project’s goal of providing a warm meal and clean drinking water to our fellow neighbors that moves me to donate, attend and participate. 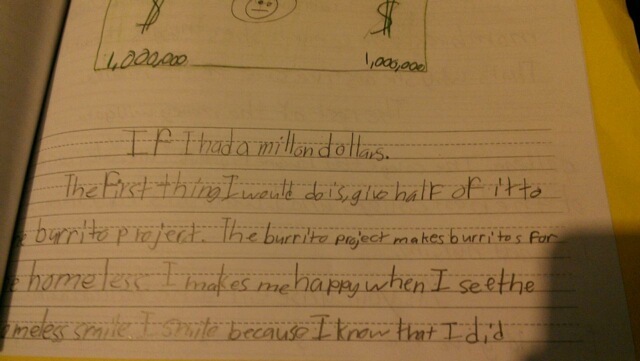 With a burrito and a smile it’s possible to make a difference in this world, thank you, Burrito Project. The Burrito Project has certainly changed my whole outlook on life. I have met amazing people who became like family to me. The Burrito Project has been inspirational, mind-opening and a whole lot of fun. The coordinators are fantastic, the organization is great and the volunteers are incredible. 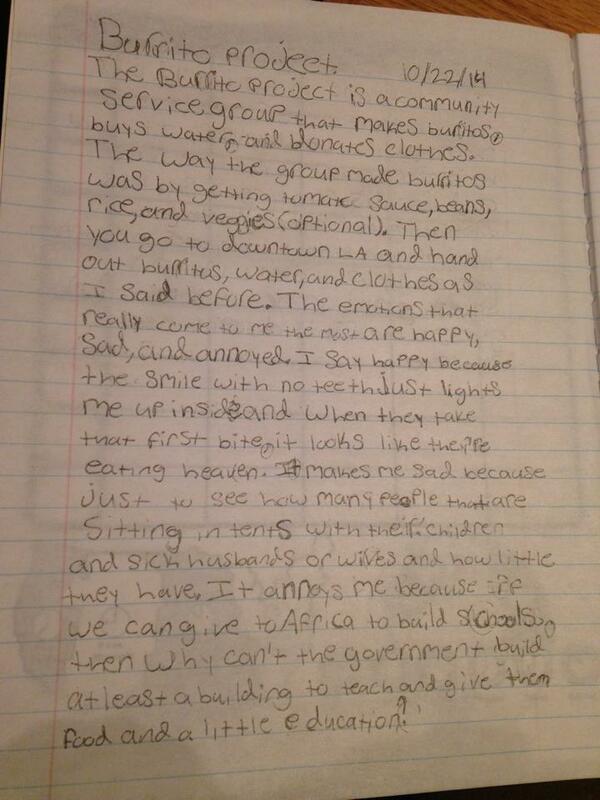 The Burrito Project has given me the opportunity to impact directly on the lives of those in need. You will make great friends, have a sense of achievement and make a difference. Volunteering does make a difference-slowly but surely. Thanksgiving Part I: Serve them and you will love them. If you find yourself having difficulty loving someone, I challenge you to serve them. Through service, you will come to love them. 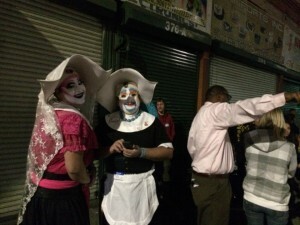 The Los Angeles Sisters of Perpetual Indulgence‘s first outing with The Burrito Project South Pasadena! 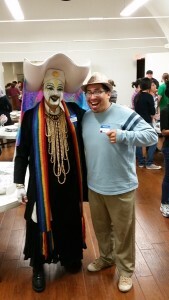 This past Thursday, January 15th, 2015, several Sisters and myself attended a monthly event called, The Burrito Project. It really humbled me and made me reflect. When I got home I wrote up a snippet of my experience to share with my fellow, Los Angeles Sisters of Perpetual Indulgence. I think this is OK to share with you all as well. 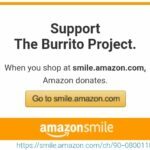 The Burrito Project, can use your support and you just might carry on the idea and use it in your own community. Yesterday, while manifesting I had a strange feeling. I wasn’t sure what it was- I felt nervous, uneasy, unknowing what the night would offer. During the day and leading to the event I messaged and stayed in contact with the attending Sisters (Fatty, Babs & Eartha). I didn’t want to be the lone Sister, I wanted Our presence to be solid, that we knew what we were doing. I walked into the multipurpose room and I was immediately surprised and relieved. There were maybe 90 to 100 people in the room all in a organized setting. When I was seen/spotted (I don’t know how, I didn’t wear glitter, not sure how I stood out in the crowd), I saw nothing but smiles and could hear people say, “The Sisters are here.” This group accepted, or more like welcomed Us, and many knew us; or of us. It was relieving. Well, then my friend Alan Pinel did a nice intro to what The Burrito Project is and what we were going to do that evening. There were several group tables set up family-style, we did an assembly line of making hundreds of burritos at each table. Our table alone probably made a good 150 burritos! In total last night we made a good 1,000 burritos! Postulant Eartha did a great job scooping beans, while I scooped rice and Eartha’s mother helped with the tortillas. After the burritos were made, they were placed in green bags (reusable shopping bags) and everyone that was going to Phase II for the distribution in Downtown Los Angeles either took a bag of burritos or a case of water, or blankets/socks/jackets/sweaters/toiletries. We were told where we were going to drive, park and meet on Los Angeles Street in Downtown Los Angeles. 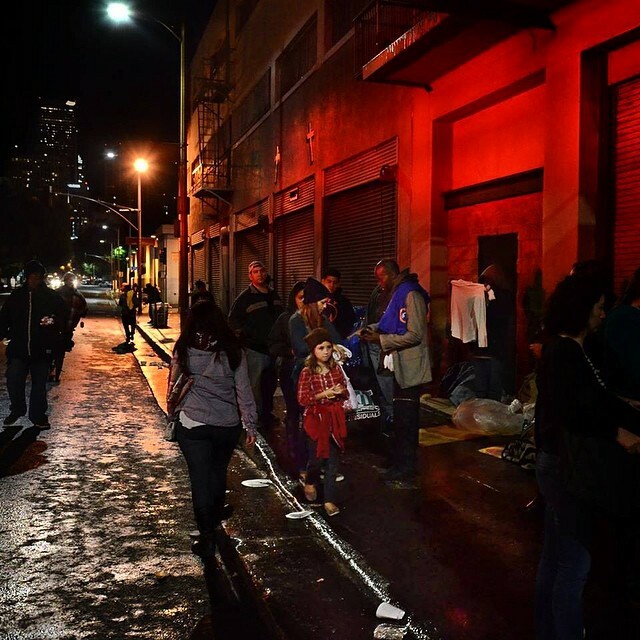 The group gathered on Los Angeles Street and got further instruction on how to hand out the items (burritos, water, blankets, socks, etc..) and how to stay safe and together. We were divided into 2 large groups, Sister Fatty & Novice Sister Babs went with one group, then Postulant Eartha & I went with the other group. It sorta helped us have The Burrito Project folks see we didn’t have to all be together. We all stayed together in the individual groups and walked in what is called the Toy District of Downtown (ok, Skid Row) and around all of the Homeless Complexes/Missions. Our groups yelled out “Burritos!” “Water!” Then out of boxes, tarps, garbage made housing people came to us. They didn’t see a Drag Nun- they saw a person offering them some food and water. They were offered as many burritos or bottles of water they needed, and many were satisfied with just one of each. No greed, they thanked us and blessed us, called us angels and wished us well. We were seen by the local LAPD patrol cars and watched from afar. The streets we walked weren’t the best, or even brightly lite, but I felt safe. I felt humbled, I felt fortunate. It was a different kind of Sister experience for me. I had never given out food to the homeless and I think part of my anxiety was tied to that. 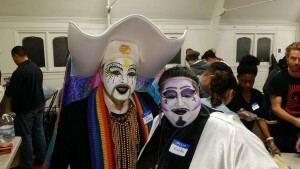 I was doing this for the first time as a Sister with a group I’ve never worked with before and on Skid Row, late at night. My experience was rewarding, it was good to see people that just needed water get it. While distributing burritos and water, I was stopped by a homeless woman. She said, “I know you! Geez! Even a homeless woman knows and remembers The Sisters. Although it left me remembering her, she is still out there after all these years. Sisters- this event happens monthly. If you could attend in the future in or out of face, you will have a truly unique experience. I plan on attending again, and I think Sister Fatty, Novice Sister Babs and Postulant Eartha would attend again. Postulant Eartha, I read your post- I know that I came away with a lot from last night; thank you for sharing your experience! Babs it was impressive all the talking and strategizing you were doing with Burrito Project folks last night! And Lil’Sister Fatty- I saw the passion you have for helping the homeless, thank you! Seriously Sisters- I challenge, I urge each of you to come at least once.